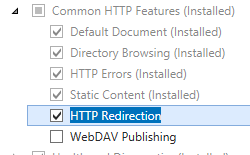 The <httpRedirect> element configures settings for Internet Information Services (IIS) 7 that redirect client requests to a new location. There are several reasons why you might want to redirect clients to a new location. For example, if your company is migrating to a new Web site, you could redirect all requests from the old Web site to the new Web site. Likewise, if you have deployed a new application on a Web server, you could redirect all requests for the old application's URL namespace (for example, http://www.contoso.com/app_v1.0/) to the new applications location (for example, http://www.contoso.com/app_v2.0/). In the simplest configuration, you need only set the enabled and destination attributes of the <httpRedirect> element in order to redirect clients to a new location. 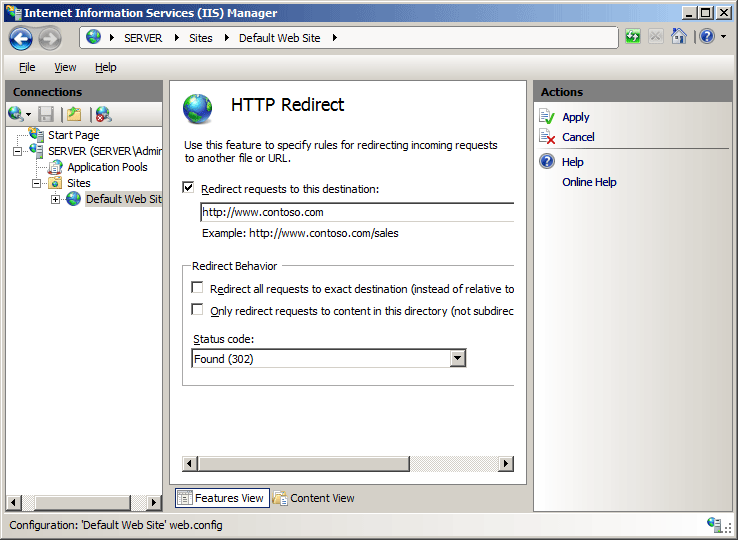 However, additional elements like the exactDestination and httpResponseStatus attributes allow you to configure the end-user experience of the redirection by respectively specifying whether IIS 7 will return the destination URL exactly as entered and which HTTP response code to return to the Web client. IIS 10.0 An additional HTTP response status was added to the <httpRedirect> element in IIS 10.0. 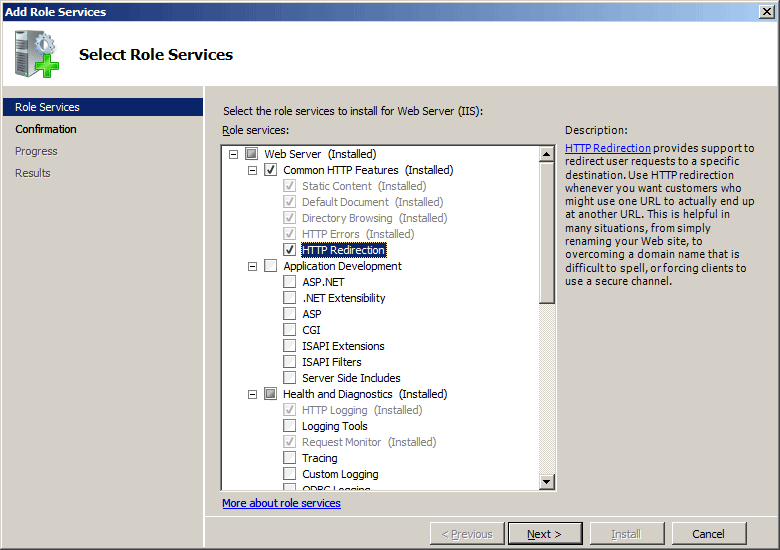 IIS 8.5 The <httpRedirect> element was not modified in IIS 8.5. 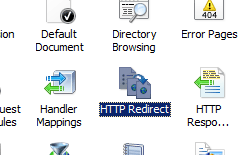 IIS 8.0 The <httpRedirect> element was not modified in IIS 8.0. 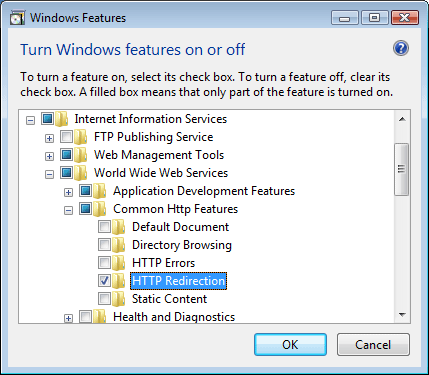 IIS 7.5 The <httpRedirect> element was not modified in IIS 7.5. 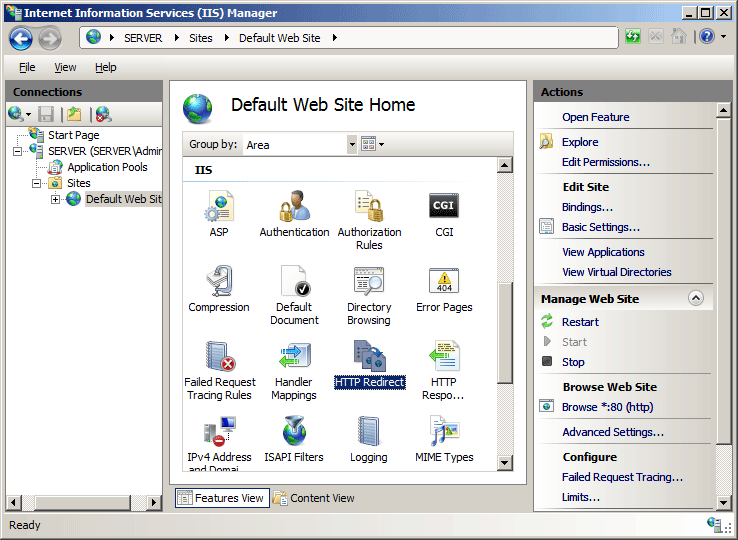 IIS 7.0 The <httpRedirect> element was introduced in IIS 7.0. 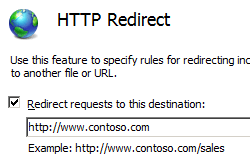 IIS 6.0 The <httpRedirect> element replaces the IIS 6.0 HttpRedirect metabase property. 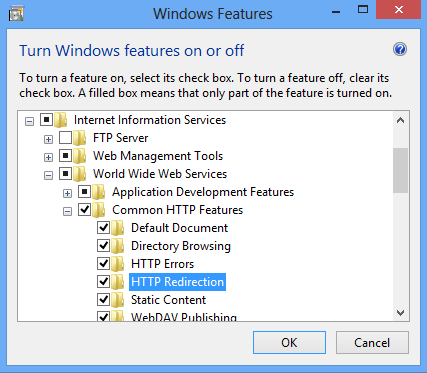 HTTP Redirection is not available on the default installation of IIS 7 and later. To install it, use the following steps. On the Server Roles page, expand Web Server (IIS), expand Web Server, expand Common HTTP Features, and then select HTTP Redirection. Click Next. Expand Internet Information Services, expand World Wide Web Services, expand Common HTTP Features, and then select HTTP Redirection. 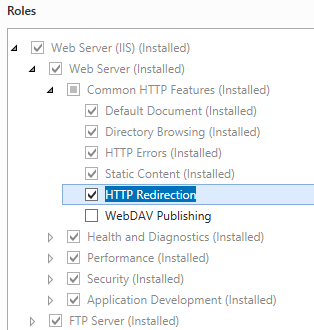 On the Select Role Services page of the Add Role Services Wizard, expand Common Http Features, select HTTP Redirection, and then click Next. 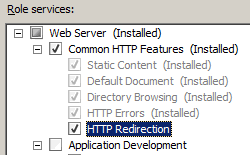 There is no user interface for adding wildcard HTTP redirects for IIS 7. For examples of how to add <add> elements to the <httpRedirect> element programmatically, see the Code Samples section of this document. 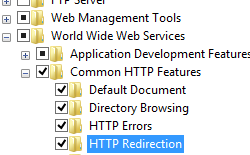 In the HTTP Redirect pane, check the box to redirect requests and enter the destination URL. Specifies whether the destination value should be added to the beginning of the file name that contains the request to be redirected. For example, if childOnly were set to true and the destination value were configured to be http://marking.contoso.com/, a request for http://contoso.com/default.htm would be redirected to http://marketing.contoso.com/default.htm. Specifies a URL or virtual path to which to redirect the client. 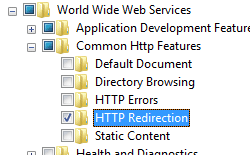 Specifies whether redirection is enabled (true) or disabled (false). Specifies that the destination value should be considered an absolute target location, not a relative location. The httpResponseStatus attribute can be one of the following possible values. The default is Found. Returns a 302 status code, which tells the client to issue a new request to the location specified in the destination attribute. The numeric value is 302. Returns a 301 status code, which informs the client that the location for the requested resource has permanently changed. The numeric value is 301. Returns a 307 status code, which prevents the client from losing data when the browser issues an HTTP POST request. The numeric value is 307. Returns a 308 status code, which informs the client that the location for the requested resource has permanently changed. The numeric value is 308. Adds a wildcard redirection rule to the collection of redirection rules. Removes all references to wildcard redirection rules from the collection of redirection rules. Removes a reference to a wildcard redirection rule from the collection of redirection rules. The following default <httpRedirect> element is configured in the root ApplicationHost.config file in IIS 7 when the HTTP Redirection role service is installed. This configuration section inherits the default configuration settings unless you use the <clear> element. The following configuration sample enables redirection and configures the destination URL to which clients are redirected. The following configuration sample adds a wildcard redirection entry that redirects all requests for PHP files to the home page of your Web site. This example is useful if you have removed all ASP-based applications from your Web site and you wanted client requests for the old applications to be redirected to the root of your Web site rather than receiving an HTTP 404 Not Found response. The following code samples configure the Default Web Site to redirect all requests to "http://www.contoso.com" using an HTTP 302 status code. appcmd.exe set config "Default Web Site" -section:system.webServer/httpRedirect /enabled:"True"
appcmd.exe set config "Default Web Site" -section:system.webServer/httpRedirect /destination:"http://www.contoso.com"
appcmd.exe set config "Default Web Site" -section:system.webServer/httpRedirect /exactDestination:"False"
appcmd.exe set config "Default Web Site" -section:system.webServer/httpRedirect /httpResponseStatus:"Found"
The following code samples adds a wildcard redirection entry that redirects all requests for ASP files to the home page of your Web site. appcmd.exe set config "Default Web Site" -section:system.webServer/httpRedirect /enabled:"True" /exactDestination:"True" /httpResponseStatus:"Found"
appcmd.exe set config "Default Web Site" -section:system.webServer/httpRedirect /+"[wildcard='*.asp',destination='/default.htm']"